Even on large vessels, machinery spaces tend to be cramped and have reduced accessibility. Knowing this, FCI Watermakers offers its renowned high-efficiency Neptune+ Series in a convenient, modular configuration for a wide variety of flexible installations. It delivers 3,400–10,000 gallons of pure, fresh water every day. Refitting large framed or skid-mounted watermakers commonly requires cutting the deck—an enormous added expense. With FCI’s Neptune+ Modular, individual components are easily brought into the engine room through a door or hatch. Once inside, they can be installed wherever access needs and the space dictate. The Neptune+ Series is the industry standard for a large, commercial-grade watermaker. Using only non-proprietary parts and premium components, it defines quality and reliability. Its state-of-the-art V4 controller bears type certification approval from ABS, CE, GL, Lloyd’s Register EMEA, Det Norske Veritas and the Russian Maritime Register of Shipping. Using the Neptune+ is a breeze. All watermaking processes are controlled through the intuitive navigation on the marine-grade 7″ touch screen. With +APC (automated pressure control), the system will start, make water, run a diagnostic check, shut down, flush itself with fresh water and come back online—all automatically. Unlike some watermakers, the Neptune+ adapts to a wide range of water conditions. It’s tolerant of suspended particulate matter and variations in salinity. 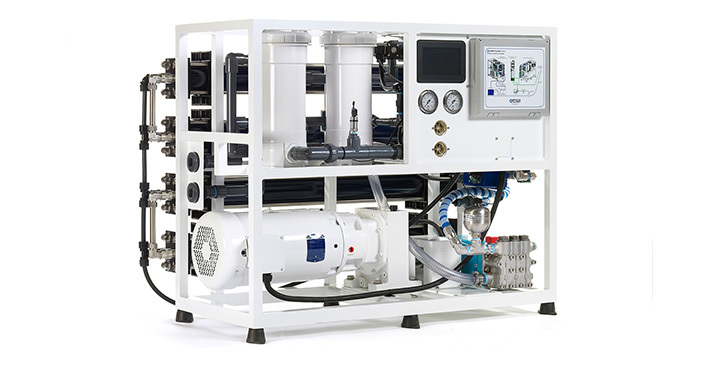 Like all FCI Watermakers, the Neptune+ is engineered and built in the USA. The company has a worldwide network of authorized dealers and distributors in 60 countries across six continents. This assures parts are available, no matter how distant the port.